By the time we arrived home from the Christmas concert matinee, it was dinner time. We needed a quick, easy, family-friendly veggie meal. As I began pulling things from fridge and freezer, I laughed… Every item–fresh, frozen, and condiment–came from Trader Joe’s! I don’t have hard-and-fast recipes for the items on this menu, mostly because I change it up based on what I have on hand (for example, you could add bell peppers, broccoli, or onion to the fried rice). Feel free to use the below as a template for your own creativity. I call it California-Asian because nothing I prepared is traditional. Other than the gyozas, I wouldn’t expect to find these on a restaurant menu. 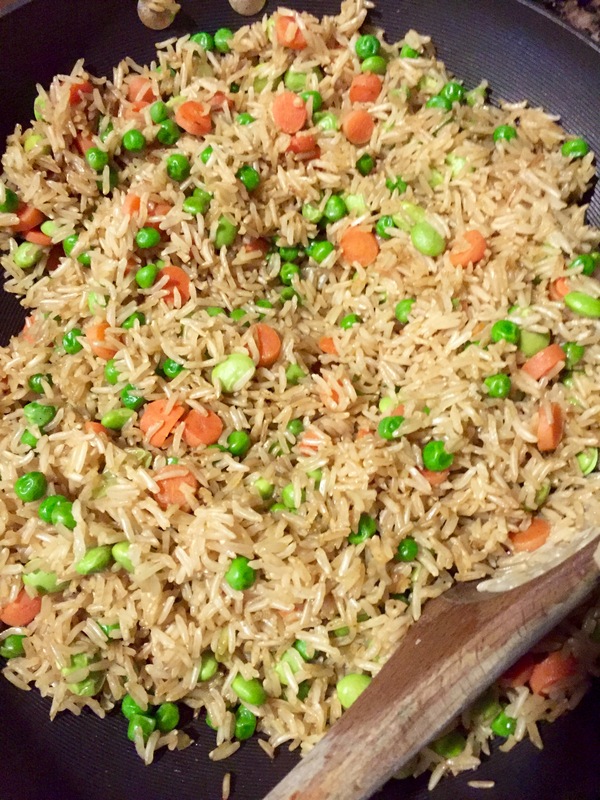 I cook the way I like to eat: lots of veggies–raw and cooked, brown rice, low oil/salt. The menu began with one of our fav quick-and-veggie freezer foods: TJ’s Thai Vegetable Gyozas. Prepare according to package directions (I have done step 1 with no oil, but they get crispier with oil). I regularly add these to soups and stir fries and serve them either as appetizer or side dish. If desired, serve with a simple sauce of low sodium soy sauce (2 Tbsp), garlic chili paste (1/2 to 1 tsp), and a few dashes of sesame oil. 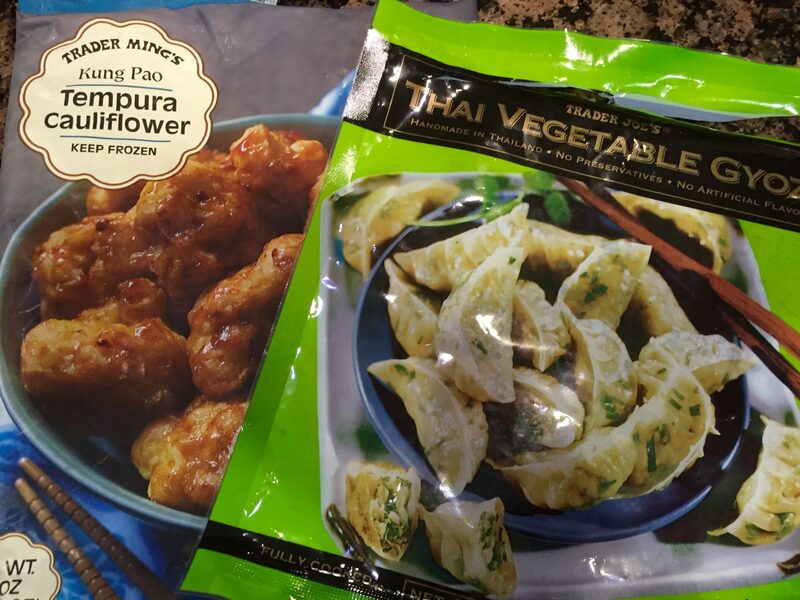 The Tempura Cauliflower were an impulse purchase, but oh-so-yum! They couldn’t have been easier to prepare and tasted like spicy fried clouds hot out of the oven. Add veggies to a container that can be secured with a tight lid; rough rule of thumb: mostly cucumbers, some carrots, a touch of onion (or 3 parts cuke, 1 part carrot, 1/2 part onion). Add garlic and ginger, a few generous splashes of vinegar and, if desired, a couple of drops of oil. Secure lid and give your salad a shake. Shake occasionally as you prepare the rest of the meal. Next I grabbed cooked brown rice from the fridge, my go-to TJ’s Brown Basmatic Rice (it cooks in 20 minutes and–bonus–smells like popcorn!). Heat a wok or large pan over medium-high heat. Add rice, and stir until warmed through and beginning to crackle. Make a well and add chopped carrots; cook, stirring often, for 3 minutes. Add drained peas and edamame and cooked until warmed through. Add soy sauce, sesame oil, and garlic chili paste to taste. Finally, I steamed a package of broccolini for about 3 minutes until bright green, and then squeezed juice of half a small lemon over. Today is Guy’s birthday. He’s spending the day on an outdoor adventure with friends, so we’ll stay in tonight for a warm and cozy family meal. We’re having White Bean and Pasta Soup with Orchard Crumble for dessert. Whatever you’re eating, I hope you eat intentionally, surrounded by love. Happy New Year! 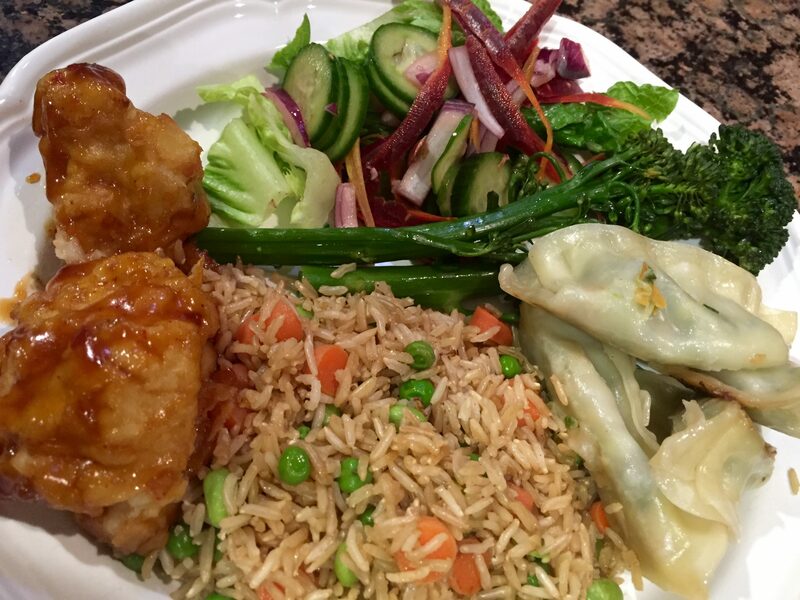 This entry was posted in cooking, Uncategorized and tagged Asian food, broccolini, cucumber salad, family-friendly, fried rice, gyozas, tempura cauliflower, Trader Joe's, vegan, vegetarian, vegetarian kids by Milagro Mama. Bookmark the permalink. That looks like such a delightful meal!